Venezuela’s reversal of economic fortune started in the 1970s. The reasons why this happened are subject to an intense and ongoing debate between academic experts. Venezuela’s strong dependency on oil is a prime suspect along with a number of other reasons, first and foremost the unusually high degree of government regulation of the labor market. From 1974 onwards, the applicable rules were tightened even further to a level that was unprecedented almost anywhere else in the world – let alone Latin America. From adding the equivalent of 5.35 months’ wages to the cost of employing someone in 1972, non-wage labor costs soared to add the equivalent of 8.98 months’ wages in 1992. Thanks to the Venezuelan oil deposits – the largest in the world – and the oil price explosion that coincided with Chávez’s presidency, filling his government’s coffers to the brim, his large-scale experiment in 21st-century socialism got off to a promising start, although it would eventually descend into economic disaster, hyperinflation, hunger and dictatorship. In the early days, Chávez employed a surprisingly conciliatory rhetoric, casting himself as a great admirer of Western values who welcomed foreign investors, a “Tony Blair of the Caribbean”. Much as the Communist Party in East Germany had promised in 1945 to uphold property rights and entrepreneurial initiative and refrain from imposing a Soviet-style system, Chávez initially vowed that he would never “expropriate anything from anyone”. This didn’t stop him from denouncing “savage neo-liberal capitalism” and celebrating Cuban socialism as a “sea of happiness”. The oil industry, by far Venezuela’s most important source of revenue, had already been nationalized in 1976 with the creation of the oil and natural gas company Petróleos de Venezuela, SA(PDVSA), which employed a workforce of 140,000 in 2014. Although state owned, PDVSA was run like a for-profit enterprise and “recognized as one of the best-run oil giants in the world”. Thanks to the company’s strong links with private enterprises overseas, Venezuela was able to increase its oil production to 3 million barrels a day during the 1990s. However, the conflict between workers and the socialist government didn’t stop there. In 2006, energy minister Rafael Ramírez, who also happened to be the head of PDVSA, threatened workers that they would lose their jobs unless they backed Chávez in the upcoming elections: “PDVSA is red, red from top to bottom.” Chávez himself affirmed: “PDVSA’s workers are with this revolution, and those who aren’t should go somewhere else. Go to Miami.” The company’s profits were used to fund social welfare programs, keep failing companies afloat and build homes for the poor at a cost of billions of dollars a year. PDVSA was even enlisted to pay for welfare programs in the US. In November 2005, Chávez ordered the company to supply heating oil to low-income households in Boston at 40% below market price via its subsidiary Citgo. Similar deals were struck with other cities and communities across the northeastern US. According to Citgo’s own figures, between 2005 and 2014 the program supplied a total of 235 million gallons of heating oil to 1.8 million people. Socialist Cuba and other allies also received heating oil donations. In 2007, in an attempt to secure a controlling interest of at least 60% in Venezuelan oil ventures for PDVSA, the Chávez government forced foreign oil companies to accept minority stakes or face nationalization. ExxonMobil refused and filed an arbitration request with the World Bank’s arbitration tribunal, the International Centre for Settlement of InvestmentDisputes (ICSID), while simultaneously taking legal action in courts in the US and the UK. After a British court froze PDVSA assets worth USD 12 billion, the state-owned company stopped selling oil to ExxonMobil in 2008 and suspended business relations. In 2014, the ICSID ordered Venezuela to pay ExxonMobil USD 1.6 billion in compensation. When Chávez first came to power, over 50% of the oil production profits went to the government. By the time of his death in 2013, the government take of over 90% was one of the highest in the world. Chávez hugely benefited from the oil price explosion during his time in office. By the time of his death in 2013, the oil price had skyrocketed to USD 111 per barrel – more than ten times as much as the historic low of USD 10.53 in 1998 when he took office. Rising natural resource prices have a tendency to seduce governments into handing out their bounty right, left and center, rather than creating cash reserves to safeguard against future slumps in the natural resource markets. Following his re-election in 2006, Chávez nationalized an increasing number of industrial enterprises, starting with the iron and steel industries. Government takeovers of the cement and food sectors, power utilities and ports soon followed. Between 2007 and 2010 alone, around 350 businesses were moved from the private to the public sector. In many cases, executive positions in the newly nationalized enterprises were awarded to loyal party members. With one in three workers employed in the public sector by 2008, the government payroll ballooned. When his government offered massive tax and financing incentives to companies run by workers’ cooperatives, their number increased from 820 in 1999 to 280,000 in 2009. The majority of these were unproductive shell companies that only existed so their owners were able to access subsidies and cheap cash loans. Chávez’s interference in economic affairs became increasingly heavy handed. The ‘immunity decree’ in Venezuela’s Organic Labor Law for Workers, which prohibited mass dismissals for operational reasons, proved calamitous for some companies. The government also set very cheap fixed prices, in many cases below production cost, for meat and other basic food items. Companies that refused to sell at these prices were denounced as speculators and threatened with prison sentences. While the oil price was high, there appeared to be no limits to the boundless generosity of Venezuela’s 21st-century socialism. Critics of capitalism around the world admired Chávez for the social welfare programs he funded with free-flowing oil revenue: cash transfers to the poor, and government subsidies for food, housing, water, power and phone services. Filling up with petrol cost next to nothing – tipping the attendant would often cost more than the actual fuel. US dollars, which were in plentiful supply thanks to the oil revenues, were exchanged at preferential exchange rates. Badly managed public enterprises received generous subsidies, which enabled them to retain more employees than they needed. The payment of oil revenues into a rainy-day fund had already been stopped in 2001, and investment in the oil industry – the very basis of the country’s livelihood – was also sacrificed in favour of ever more ambitious social spending plans. Chávez’s admirers thought they were witnessing a socialist miracle – after all, his social policies succeeded in reducing extreme poverty by 50%, according to official figures. Whether these figures can be trusted is another question. For example, Chávez’s claim to have improved the literacy rate by 1.5 million is a “gross exaggeration”, with the real figure closer to 140,000 according to calculations by the Venezuela expert A. C. Clark. Likewise, the homicide statistics published by Chávez’s regime exclude victims of gang-related violence as well as those killed “resisting authority”. According to data compiled by the Venezuelan human rights organization PROVEA, the total number of crime-related deaths averaged 15,000 a year between 2000 and 2005. After Chávez’s death in 2013, his successor and former second-in-command Nicolás Maduro accelerated the nationalization of dairies, coffee producers, supermarkets, manufacturers of fertilizers and shoe factories. Production buckled or stopped entirely. Then the oil prices plummeted, losing almost 50% of their value within a single year from USD 111 per barrel in late 2013 to USD 57.60, then dropping to USD 37.60 another year later and fluctuating between USD 27.10 and USD 57.30 in 2016. While this would have caused a predicament for any oil-producing nation, these problems were amplified in a country with an extremely inefficient socialist economy and strict price controls. Now the fatal effects of Chávez’s socialist policies became obvious once and for all. The entire system fell apart. As in other countries, it became apparent that, far from being an efficient means to fight inflation, price controls only make it worse. Inflation reached 225% in 2016, higher than anywhere else in the world except for South Sudan. It was probably close to 800%, accompanied by a 19% drop in economic output in 2016, according to an internal report by the Governor of the National Bank. Although Venezuela owned state-of-the-art money presses, including a German-made Super Simultan IV, these were no longer up to the task of printing the huge numbers of bills required. Venezuela was forced to outsource a large share of this work to companies based in the UK and Germany and the central banks of some friendly nations. Boeing 747 planes carrying between 150 and 200 tons of bills landed in Venezuela every two weeks. Today, the inflation rate is well above 1,000,000%(!). Because many goods were subject to price controls, while raw materials and production goods had to be paid for in US dollars, the decline of the currency led to increasingly dramatic shortages in supply. People started hoarding all sorts of things that were sold very cheaply and would frequently queue for hours to buy something they would then sell on at a much higher price on the black market. This is what happened with toilet paper, which was hardly ever available in the shops any more. The companies making it were forced to sell it at a fixed price far below production cost, which was driven up by inflation. And when production was suspended due to the lack of raw materials, the workers still had to be paid because companies were not allowed to reduce their workforce without government approval. However, the head of the National Statistics Institute managed to turn the toilet paper shortage into a good-news story, hailing it as proof of the plentiful national diet. In July 2016, 500 Venezuelan women took the extraordinary step of crossing into neighboring Columbia via a closed border crossing to buy food. “We are starving, we are desperate,” one of the women told the Colombian station Caracol Radio. There was nothing left to eat in her country, she said. A care worker in a retirement home told reporters from a German radio station about her own desperate situation. Only 9 of the 24 residents were left. The others had either died or been sent away because there wasn’t enough to eat and their supplies of essential medication for patients suffering from diabetes or hypertension had run out. Subverting a ban on visits from journalists, a doctor showed the reporters around a public hospital where the only X-ray machine had been broken for a long time, the lab was unable to process any urine or blood samples, there was no running water in the toilets and the lifts were out of order. Hospital patients had to supply their own medication because stocks of everything from painkillers to drugs for cancer treatment had run out. Within a single year, between 2015 and 2016, child mortality rose by 33%, while the rate of women dying in childbirth grew by 66%. The health minister who published these statistics was sacked by Maduro, who prohibited the release of any social or economic indicators in a bid to prevent “political interpretations”. After an initial drop from 20.3% to 12.9% over 13 years under Chávez, infant mortality reached levels above UNICEF estimates for war-damaged Syria in 2016. A 2016 survey by the Central University of Venezuela found that four out of five Venezuelan households lived in poverty. Some 73% of the population experienced weight loss, with the amount lost averaging 8.7 kilograms (20 pounds) in 2016. In a hearing before the US House of Representatives Subcommittee on the Western Hemisphere in March 2017, Hector E. Schamis, adjunct professor at Georgetown University, reported record poverty rates of 82%, with 52% living in extreme poverty. In the face of continued popular protests and an opposition victory in parliamentary elections, Maduro dissolved the National Assembly and abolished freedom of the press along with all other remnants of democracy. 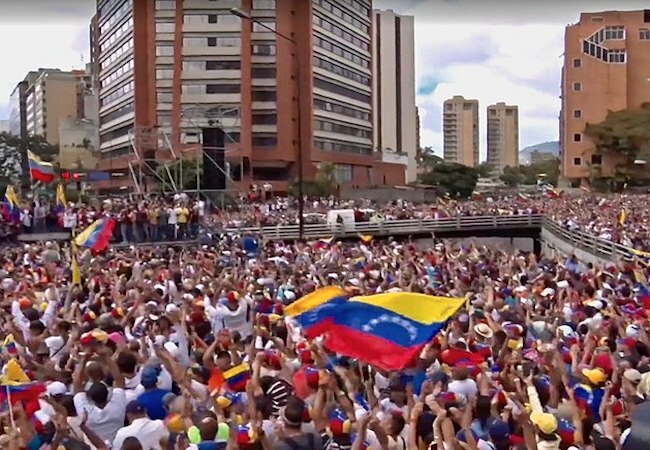 By October 2017, the death toll of those killed during anti-government demonstrations and protests had risen to over 120 – testament to the failure of yet another socialist experiment. Rainer Zitelmann holds doctorates in History and Sociology. He is the author of 21 books, most recently The Wealth Elite,which have enjoyed particular success in Asia. This text is an excerpt from the sixth chapter of his upcoming book, The Power of Capitalism, which analyzes the extraordinary economic rise of China and takes the reader across continents in a survey of recent economic history, comparing West and East Germany, North and South Korea, capitalist Chile v. Socialist Venezuela and more.